What if your dynamic visitor data could automatically trigger marketing actions? Data-driven. You’ve heard the expression a thousand times, but what does it really mean? Most analytics platforms help you build reports and get insights from your data. But that’s it. Whenever you want to make any actions based on the information you have gathered, you need to plan and execute them afterwards - when your visitor is already gone. With BySide, all data is real-time and actionable, regardless of its source: information on visit origin, frequency and location based collected directly by BySide, information given by the visitor by filling forms or answering surveys, and even customer data from your CRM (or any other internal systems) that has been integrated in the platform. You can combine information from all sources and touchpoints and build detailed profiles which can be used to fully personalise the customer journey. Also, you can use any aspect of your information as a trigger in marketing automation workflows. This way you can avoid bounce and leverage your traffic’s potential to convert - even on a first visit! Big and diverse data is difficult to understand. In fact, most companies do not struggle to get information - they struggle to extract meaning from it, to separate what is important from all the noise that can be generated. After all, data is only useful if it helps solving Marketing and Sales’ age-old challenge: understanding people. A good way to focus on the most relevant elements of customer information is to build profiles based on the characteristics that are relevant to your business. But profiles should not reflect just the online persona of your customer - that is why BySide allows you to use information from any touchpoint in order to build profiles that provide a 360ºC view of your customer. Another useful way of classifying your leads is through lead scoring. Lead scoring consists on ranking your leads according to the value that they have for your organisation: the higher the value, the further they are in the buying stage. Successful lead scoring enables marketing to establish priorities, send sales-ready leads to the sales team and create marketing automation workflows to nurture the “colder” leads until they are ready to convert. With BySide’s Lead Scoring you can score a lead based both on aspects you already know about the lead (location, organisation, device used, …) and on aspects that you can infer from a visitor’s behaviour (visit frequency, visit origin, click-throughs, …). You can also set multiple goals, such as the download of a catalogue or a contact request, and score the leads based on goal achievement. BySide’s Profiling and Lead Scoring operate in real-time. This means that whenever the visitor has new interactions or you collect new relevant information about one particular lead, the profile/score is automatically updated. Profiles and scores are a great way to organise lead information and use it to offer a fully personalised experience. They can also work as triggers to lead nurturing initiatives, such as email marketing or an outbound call, all set up within the BySide platform. No metric is more important than ROI. Big brands invest big bucks and they expect to see big returns. Nevertheless, we often see companies struggling to measure lead generation campaign performance. This is usually due to the proliferation of lead generation channels, each one with its own campaign analytics system - and sometimes with different metrics. On top of that, companies usually have several different touchpoints where the costumer can convert: website, app, other online distribution channels, contact center, physical store, but many don’t have the ability to synchronise information between touchpoints in real time. BySide brings it all together. Any campaign - and any conversion - can be tracked, regardless of where it takes place. You can generate reports, send notifications to your lead generation partners (even when the conversion happens offline!) and you can automate actions based on lead interaction with any specific campaign. Any campaign and any conversion can be tracked, regardless of where it takes place. Measuring the success of your campaigns should not be restricted to online conversion. Surprisingly, a large number of companies forget to track the phone calls that are generated by online investment - for instance, calls to phone numbers that appear on landings pages for AdWords campaigns. If you don’t have this information, how can you properly calculate ROI? BySide Call Tracker fills this information gap. It allows you to attribute calls to campaigns and performance based advertising. And it goes even further - connecting each call to each specific online visitor. By doing this, your company is able to get insight on the profile and all past interactions of the person who’s trying to reach you. Your customer service team can effectively use that information to understand who that person is, what is he/she looking for, and adapt their interaction on the phone. This also means that call information will be stored under that visitor’s activity own record, and therefore will be available to use as a trigger in a marketing automation workflow or as personalisation parameter. BySide Call Tracker can either be used right away without any call integration or through seamless integration with any call center platform. 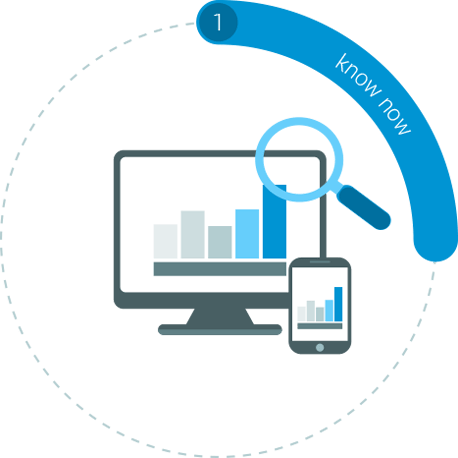 If you bring BySide’s Call Tracker and Click2Call functionalities together, you get the most comprehensive call management suite for any company to which phone calls bring about an important share of the revenues. It’s simple - no decision should be taken without evidence that supports it, and that evidence must use data. So, nothing new here. What’s new is the immensity of information that is generated nowadays within one single company, and the challenges that come with integrating, understanding, and explaining it to project stakeholders. BySide’s Smart Data takes away the complexity of managing Big Data in real time and simplifies the access to the information by providing flexible, customised dashboards and reports. This information includes both statistical cross-channel analytics data (marketing management data) and individual lead data (lead management data). You can combine and filter information to build panels that show you exactly what you’re looking for. BySide Smart Data can be explored to reveal meaningful insights that were previously unavailable or too time consuming to uncover.